Posted by ayasawada in Anime, Manga, Rave. 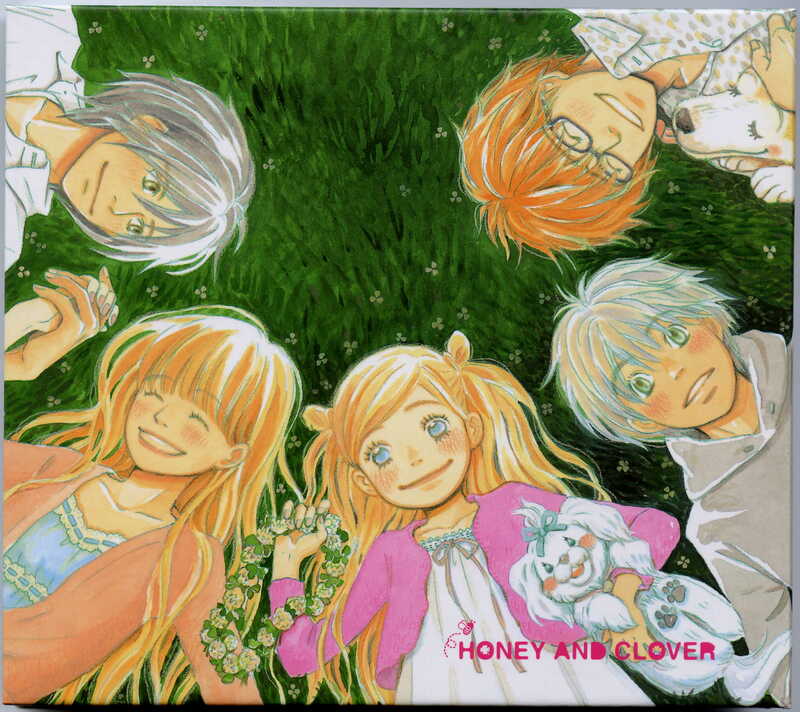 I finished reading the tenth and final volume of Honey and Clover last week. Despite knowing how it turns out — the anime having followed the manga pretty closely — I was still in tears by the end. Honey and Clover remains one of the most lovely, most profound, most perfectly paced, elegantly drawn, wonderfully nuanced series out there and a real jewel in the shojo genre. There are a lot of very general things I could go on about: Chica Umino’s fabulous art, from the detailed close-ups in emotional moments to the cute SD in slapstick scenes, the comedy timing, the hard-hitting drama, the incredibly well-rounded characters — not to mention Umino’s lovely little ‘notes from the author’ in the margins (I always love it when an author adds these personal notes — it really gives a feel for who the person telling the story is. I’ve only ever seen it in shojo manga though. Does it happen in any other genre?). But what really got me about Honey and Clover is the incredible empathy I felt for the characters and their emotional situations. From Umino’s side strips, you’d think she was typical otaku who knows nothing of real life romantic drama. Yet she writes them so well and with an aching, often bittersweet truth. Mayama: For some people, life means nothing without love. And for other people, whether they like it or not seem to be born with something they’ve got to do, like that’s what their life is for. I’m not saying one’s better than the other. And you probably don’t know which you are until the moment you have to choose, and then you just have to let your instincts choose for you. Takemoto: I’ve been wondering for a long time if love that never bears fruit means anything. If something that vanishes and is gone is the same as something that never was. Takemoto: As time passes I guess the day will come that all of this is just a memory. But… that whole miraculous time in my life is going to keep turning nostalgically somewhere far away deep in my heart, accompanied by a sweet pain forever. Just thinking about it wells me up ^^; For a hopeless, confused romantic like me, it’s disarming to have someone quote your own thoughts at you, to offer advice and wisdom on love and life, friendship, work, family, ambition and dreams. What I love about Honey and Clover is that things didn’t work out the way you’d expect. (SPOILERS) Hagu chose neither Takemoto nor Morita (and her final choice still has me going WTF, but it’s an understandable and mature one). Mayama and Yamada didn’t get together, though both found love. Those love triangles tore those friends apart and yet they remained friends. And though life inevitably meant that they parted ways, they happily took those memories with them. What Honey and Clover reminds me is that life is full of really hard choices, but they are what makes you who you are. The final volume comes with two bonus chapters that are excellent value, and a couple of really sweet short stories that show the same mix of imagination and mature views on love that you’d expect from Umino-sensei. And the ending itself goes a little beyond what is in the anime. You really want to experience both manga and anime to get the full experience, for what the manga adds in depth, the anime adds in atmosphere. To anyone who hasn’t experienced Honey and Clover before, I’d shove the books into your hands right now. Then I’d make you watch the anime, then read the manga again. It really is one of the most lovely experiences you can ever experience in anime and manga, if not romantic literature.